Similarity between two individuals in the combination of genetic markers along their chromosomes indicates shared ancestry and can be used to identify historical connections between different population groups due to admixture. 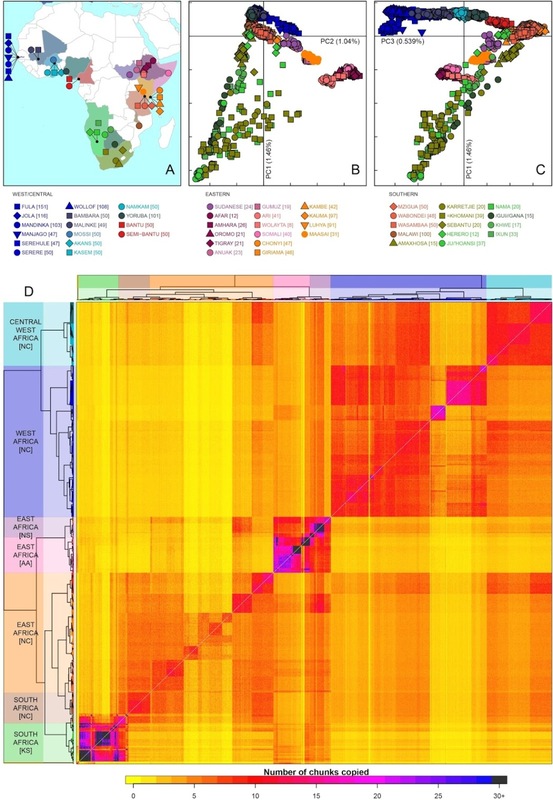 We use a genome-wide, haplotype-based, analysis to characterise the structure of genetic diversity and gene-flow in a collection of 48 sub-Saharan African groups. 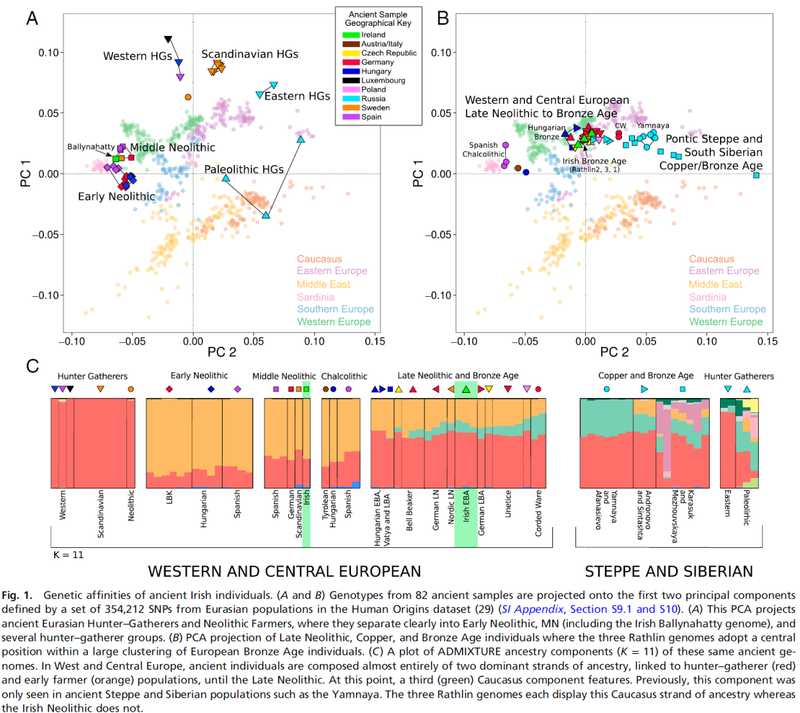 We show that coastal populations experienced an influx of Eurasian haplotypes over the last 7000 years, and that Eastern and Southern Niger-Congo speaking groups share ancestry with Central West Africans as a result of recent population expansions. (a) Maximum-parsimony tree of European MSY lineages defined here by resequencing. Branch lengths are proportional to molecular divergence among haplotypes. Key mutation names are given next to some branches, and haplogroup names20 in the coloured bar below. Three sporadic haplogroups are coloured in black. The grey box within hg R1b-M269 shows the star phylogeny referred to in the text. (b) Map with pie-charts showing frequencies of Y-chromosome haplogroups (defined and coloured as in part a) in 17 populations from Europe and the Near East. Population abbreviations are as follows: bas: Basque; bav: Bavaria; CEU: Utah residents with Northern and Western European ancestry from the CEPH collection (France); den: Denmark; eng: England; fri: Frisia; gre: Greece; hun: Hungary; ire: Ireland; nor: Norway; ork: Orkney; pal: Palestinians; saa: Saami; ser: Serbia; spa: Spain; TSI: Toscani in Italia (Italy); tur: Turkey. The proportion of Europeans descending from Neolithic farmers ∼10 thousand years ago (KYA) or Palaeolithic hunter-gatherers has been much debated. The male-specific region of the Y chromosome (MSY) has been widely applied to this question, but unbiased estimates of diversity and time depth have been lacking. Here we show that European patrilineages underwent a recent continent-wide expansion. Resequencing of 3.7 Mb of MSY DNA in 334 males, comprising 17 European and Middle Eastern populations, defines a phylogeny containing 5,996 single-nucleotide polymorphisms. Dating indicates that three major lineages (I1, R1a and R1b), accounting for 64% of our sample, have very recent coalescent times, ranging between 3.5 and 7.3 KYA. A continuous swathe of 13/17 populations share similar histories featuring a demographic expansion starting ∼2.1–4.2 KYA. Our results are compatible with ancient MSY DNA data, and contrast with data on mitochondrial DNA, indicating a widespread male-specific phenomenon that focuses interest on the social structure of Bronze Age Europe.